The White House is recruiting researchers who reject the scientific consensus on climate change for its "adversarial" review of the issue. The proposal to form a "Presidential Committee on Climate Security" at the National Security Council has shifted, into an ad-hoc group that will review climate science out of the public eye. Those involved in the preliminary discussions said it is focused on recruiting academics to conduct a review of the science that shows climate change presents a national security risk. William Happer, a senior director at the NSC and an emeritus Princeton University physics professor not trained in climate science, is leading the effort. Among those who have been contacted are the relatively small number of researchers with legitimate academic credentials who question the notion that humans are warming the planet at a rapid pace through the burning of fossil fuels. A number of the names the White House is targeting are those frequently invited by Republicans to testify at congressional hearings on climate change where uncertainty is emphasized. The stated goal of the committee, according to a leaked White House memo, is to conduct "adversarial scientific peer review" of climate science. Those involved in the preliminary discussions caution that the list of researchers, which could include scientists as well as statisticians, is still under discussion and that the shape of the committee has yet to be determined. Most of the members are expected to come from outside the federal government. Happer did lead a meeting Friday to discuss the goals of the committee, according to a White House official. It could take about a month for an executive order creating the committee to receive President Trump's signature, the official said. The official would not confirm those who attended Friday's meeting, but a memo that leaked ahead of the gathering showed representatives from NASA, the National Science Foundation, and the White House Office of Science and Technology Policy were among those invited to participate. On Friday, White House senior adviser Kellyanne Conway would not comment on why the administration was challenging the science of its own agencies. "Do you have an articulate, competent question?" she said — and then refused to answer any questions about the meeting. The list of researchers who have been approached or discussed includes: Judith Curry, a former professor at the Georgia Tech's School of Earth and Atmospheric Sciences; Richard Lindzen, a retired Massachusetts Institute of Technology professor who has called those worried about global warming a "cult"; and John Christy, professor of atmospheric science at the University of Alabama, Huntsville, and a newly installed member of EPA's Science Advisory Board. 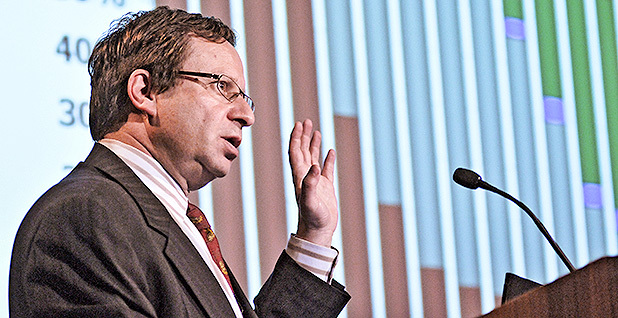 A leader of the effort is Steven Koonin, a New York University professor and former undersecretary for science in the Department of Energy in the Obama administration. It's possible the review will also include scientists who agree with the vast majority in the field of climate science that humans are warming the planet at a pace unprecedented in the history of civilization. Koonin has been actively recruiting participants for the effort. He and Happer worked with former EPA Administrator Scott Pruitt to conduct a "red team, blue team" climate debate at EPA, which would also have taken an adversarial approach to scientific peer review, but that effort was ultimately scuttled by former White House chief of staff John Kelly. The new group plans to take a close look at the recent congressionally mandated National Climate Assessment, which found that "the impacts and costs of climate change are already being felt in the United States, and changes in the likelihood or severity of some recent extreme weather events can now be attributed with increasingly higher confidence to human-caused warming." While the Trump administration signed off on the report, the president said he did not believe it. His administration attempted to bury the report by releasing it on the day after Thanksgiving. In the National Climate Assessment, scientists rate their areas of confidence by certainty. For example, an area of low confidence is the frequency of extreme storms, which present a significant national security risk. Scientists are still uncertain as to the exact effect of climate change on how often extreme storms, such as hurricanes, occur, but they're increasingly confident that climate change can make such storms more intense. The group, in particular, will look at areas of that report where the confidence is low or medium. They plan to question the conclusions of those who say the report shows climate change poses a national security risk, according to a person involved in preliminary discussions. Happer, who once compared the "demonization" of carbon dioxide to the genocide of Jews during the Holocaust, has pushed for some members of the CO2 Coalition — a group he founded — to take an active role in the White House effort, according to sources. The CO2 Coalition receives funding from the Mercer family, a key Trump donor that supports groups that attack climate science, as well as the Koch political network, which has also given millions of dollars to such groups. The coalition's board of directors and members include researchers who have received funding from the fossil fuel industry and whose work is used to tear down climate regulations. The coalition's stated purpose is "educating thought leaders, policy makers, and the public about the important contribution made by carbon dioxide to our lives and the economy." A number of its members have called for burning more fossil fuels to benefit humanity and the planet. That directly contradicts the world's top science agencies, including NASA and NOAA. They have found the consumption of fossil fuels has pushed the planet to a dangerous tipping point that could fundamentally alter civilization if it continues unabated. One group that will be excluded from the White House effort is the Heartland Institute, according to those who have participated in preliminary discussions. Happer and other researchers involved have been featured speakers at the group's events. But some participants have said they will not join the review if researchers from Heartland — which has received millions of dollars from the Mercer family — are included because a Heartland-led effort would not be considered a serious science review.